Wildlife at Hemsford - DEVON YURTS Glamping in Style! Fox visiting the yurt camp! This spring we have had some rather unwanted visitors - a pair of foxes are living at Hemsford, and have been looking to take advantage of the fact we keep poultry.I never mind the foxes living here, as long as they do not kill my hens. We have lost some in the past and its never a nice feeling when you realize that the fox has been and done his worse!!! 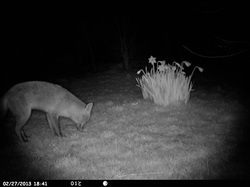 The fox pictured here is a regular early evening and daytime visitor to the fields and lanes around the yurt camp and has so far only managed to kill and take one hen. Hemsford is one of those places that has a really diverse and large quantity of wildlife living generally in harmony with the humans.!! !